Product prices and availability are accurate as of 2019-04-21 16:37:42 UTC and are subject to change. Any price and availability information displayed on http://www.amazon.com/ at the time of purchase will apply to the purchase of this product. The DoggyRide Stroller is a wonderful mobility aid for dogs! Being outside can improve and lift your dog's spirit and this protective mobility aid can help them enjoy the outdoors, even if they are unable to run and play like they used to. This product does have size and weight restrictions, so please review them if you are wanting to purchase this product. We hope this helps in caring for your dog! This Original dog jogger-stroller is a quality constructed product, based off of Dutch design. The Original dog jogger-stroller comes in a red/black color pattern, includes a safety leash set and safety flag, and can easily be folded with the release of just one pin. The ideal maximum loading capacity is 100-Pound This trailer is suitable for dogs weighing up to 100-Poundand with a maximum shoulder height of 26-Inch. Interior cabin dimensions are 31.5-Inch L x 21-Inch W x 25.5-Inch H. The product's overall width of 30.5-Inch allows for it to fit through most doorways. The front wheel has an internal wheel aligner which, once aligned, works to keep the front wheel locked and moving straight when using the front wheel in jogger mode. The upper roof structure can be unzipped in two ways allowing for you dog to use its personal sunroof, or have the entire front panel open. The lower center of gravity provides better stability and allows for a dog to easily enter and exit the cabin on its own. The cabin's sturdy UV resistant side and front mesh panels provide constant air flow when riding but also protect the dog from dust and bugs. Its durabability means that your dog will not paw at and rip a hole through these mesh screens. 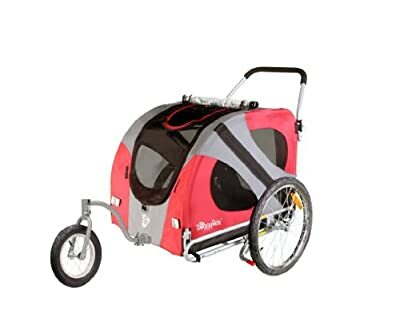 When not used as a stroller, the cabin can be converted into a bike trailer, with optional kit, or used as a crate or tent for a dog. This product meets or exceeds ASTM standards. Just because a dog is ill, injured, aging or otherwise disabled is no reason for it not to be able to continue to enjoy the sights, sounds and smells of the wonderful outdoors with you. With the help of DoggyRide, any dog can enjoy the outdoors with you. Dutch Dog Design puts the health, comfort and safety of both you and your dog at top of mind when designing its DoggyRide brand of market leading dog jogger-strollers. The DoggyRide Original jogger-stroller is the original inspirational product for the inception of DoggyRide dog jogger-strollers. Problem: The lovable but less mobile senior dog still wanted to enjoy quality time with his owner. The owner enjoys jogging outdoors. Solution: Created a new jogger-stroller, specially made just for the dog! Given its cabin size of 31.5" L x 21" W x 25.5" H, this stroller is suitable for larger dog breeds such Samoyed, Labrador or shorter in length golden retrievers, or, multiple small dogs.The Original is a cost-effective and multi-functional solution to be able to take your senior dog outdoors for a stroll - to the park, to the market, around town to visit friends, or wherever your adventure may lead you. Staying true to its adaptable nature, once the jogger-stroller wheel's aligner is set for the first time, the wheel will be able to be locked into place for jogging purposes, which is great for joggers as there will not be the need to constantly course-correct. Or, the wheel can be left unlocked to be able to swivel freely for use as a stroller. To make for a complete outdoors experience, accessory pieces include a cargo roof rack for public market adventures, a rain cover for rainy day strolls, a luxury pet mat to make for a cushioned and comfortable ride, or even a bike conversion kit for use as a bike trailer. Considering all of these options, this jogger-stroller will last a lifetime. This jogger-stroller will arrive to you mostly pre-assembled. Upon receiving it, simply remove it from the box, fold up both side walls, move the interior cross bar arm, located along the roof, into place and lock the crossbar with the included silver detent pin. Bracket push bar holders will be included in a small box. These bracket push bar holders are to be installed on the rear frame of the cabin by pushing the slits in the fabric aside and screwing the holders into place. The push bar arm can then be inserted into the holders and locked into place with the included silver detent pins. Do not attempt to attach the push bar before locking the interior cross bar arm into place. Now all that is left is attaching the wheels. The side wheels will attach to cabin by inserting the axle through the wheel center and locking them into place with the C-shaped locking pins. Finally the front stroller wheel is attached by first removing the front locking pin, inserting the wheel into the front reception tube, then passing the locking screw through the bottom set of holes, repositioning the nut on the opposite side, then finally flipping the silver lever back to secure the locking pin into place. Ready to use the jogger-stroller for another purpose, this time at home? The jogger-stroller easily converts to a crate for long car rides or home use by simply removing the wheels and push bar arm. The overall product width of 30.5" is wide enough to be roomy for your dog(s) but still narrow enough to fit through most standard doorway. Need to take your dog with you to your doctor appointment? To its doctor appointment? Need to do so on public transit? Now you can safely and securely take your dog with you in its own jogger-stroller. Where Will You DoggyRide Today?